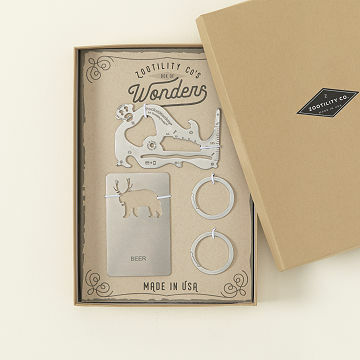 This tool set includes thin, stainless steel tools, each with an animal friend incorporated into the design. We humans tend to think of ourselves as being pretty, well, evolved. Turns out we could stand to learn a thing or two from other members of the animal kingdom. Animals in the wild tend to be pretty handy, while we get frustrated when we can't open our beers on the first try, or can't pop on a new keychain without breaking a nail. Enter: your new tool set. It features stainless steel, ultra-thin, and versatile tools, each with an animal friend incorporated into the design. Keep the set around the house or give it as a gift to ensure that the recipient is ready for anything. Made in Portland, Maine. Nate Barr is an engineer and an artist, two professions that feel polar, but together are something magical. Earlier in his career, Nate worked as a mechanical engineer at a product design firm. But he realized what he really wanted to do was create something beautiful, original, and tactile. When his wife, Bryn, asked him to make a set of tools that was attractive and portable, he found an excellent opportunity to blend both sides of his brain. The Tulry Utlity Necklace is a stunning piece whose shimmering, chevron sections slide off to act as portable tools. "A lot of everyday products are designed with a male-centric audience in mind," Nate says. It's his mission to change this by creating functional designs that aren't geared exclusively toward men. He also advocates for sourcing and creating items in the US, as well as paying his employees a living wage. It's his hope that he might inspire others to keep their practices local and fair. Nate lives and creates in Portland, Maine. I gave this as a gift. It was perfect.